In North Carolina, marital property is all property acquired during the course of the marriage, which is subject to an equitable division when a couple gets divorced. Separate property is everything that a spouse acquired prior to the marriage, or individually inherited or received as a gift during the marriage. Separate property is not subject to division during a divorce. Family law attorneys often receive questions regarding pension benefits, and how they are classified for purposes of a divorce. In North Carolina, a pension plan is classified as marital property, regardless of whether it has vested at the time of the separation. The reason for this is that the spouse with the pension made the pension contributions during the course of the marriage. An exception to this, however, is contributions that the spouse with the pension made prior to the marriage. In that scenario, the share of the pension that spouse contributed prior the marriage is separate property for purposes of the divorce division. This is calculated based on the proportion of time the marriage lasted versus the total time of employment. There are several factors that make pensions a different type of asset. The first is that not all pensions are the same and there are different valuation methods of pensions. A skillful attorney can help you navigate the nuances. The second is that the spouse with the pension is not actually able to access the money in the pension until retirement. The third factor is that pensions are operated by administrators, who must comply with strict laws in managing and distributing benefits. As marital property, pensions are subject to equitable division by the court. The North Carolina General Statutes § 50-20.1 sets forth how this is accomplished. 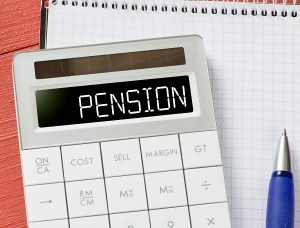 For unvested pensions, the court will determine the value of the pension and the percentage that each spouse should have, then enter an award payable by: (1) a lump sum by agreement of the spouses to offset the pension; (2) a payment plan of fixed payments over a specified term; or (3) by issuing a Qualified Domestic Relations Order (QDRO). A QDRO is a separate order that requires the pension administrator to pay a “prorated portion of the benefits” to the other spouse at the time when the spouse with the pension begins to receive benefits. If you are separating or divorcing, you need help. Pensions are just one of many types of property that you will need to identify, appraise, and classify. It is critical to get this done right the first time, as your financial future is at issue before the court. With decades of experience, let New Direction Family Law take you through this difficult journey one step at a time. Call our office at (919) 719-3470 to schedule an initial appointment, or visit our website. We serve Wake, Johnston, Lee, Harnett, Cumberland, Nash, Granville, Franklin, and Durham counties.